The Breeders’ Cup is an annual meeting for grade I-III thoroughbred horses held in the US at the beginning of November at various tracks and locations. The Breeders’ Cup was initially intended to host North American thoroughbred horses but the meeting attracts other high class thoroughbreds, especially from the UK and Europe. The Breeders’ Cup is a world championship and is considered one of the most prestigious horse racing events in the international horse racing calendar. The Breeders’ Cup has been here since 1984 when it first took place at the Hollywood Park racecourse. Prior to that, Breeders’ Cup limited, the company operating the Breeders’ Cup event, was formed in 1982 by John R. Gaines, who was one of the leading thoroughbred owners and breeders in North America at the time, in order to create an event that would serve as the end of the season event for thoroughbred racing and in order to promote horse racing and form unity among the people in the industry. Since 1984 and up until 2006 the Breeders’ Cup was held as a one day event. It was only in 2007 that three new races were introduced, Filly and Mare Sprint, Juvenile Turf and Dirt Mile and three more at 2008, Turf Sprint, Juvenile Filly Turf and Juvenile Filly Marathon that lead to the expansions of the event to two days. There are 14 different races held at the two day event of the Breeders’ Cup, each of them ran at different qualification needs such as grade, track distance and surface and age and gender of the horses. Each race has handsome purse (money prize) offered to the winner when the lowest purse, $500,000, goes to the winner of Breeders’ Cup grade 3 Marathon winner, and the highest purse, $5,000,000, goes to the winner of the Breeders’ Cup grade 1 Classic winner. The event’s location varies every year but there is a fixed list from which racecourses are selected to host the Breeders’ Cup event. Among the racecourses that have hosted the Breeders’ Cup are Churchill Downs, Santa Anita Park, Belmont Park, Hollywood Park and Gulfstream Park. The event was regularly held in the US since its forming except for 1996 when it was held at the Woodbine Racecourse in Canada. 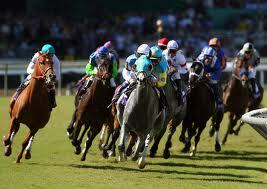 A horse must meet the qualification of the race in order to be cleared to participate in a race at the Breeders’ Cup. 14 horses are selected for each race except for the Juvenile Fillies Turf, Dirt Mile and Juvenile Turf which have only 12 horses running them. The Breeders’ Cup Company uses a field selection system based on horses’ performance in the Breeders’ Cup Challenge races, a point system and panel of horse racing experts ranking the horses. Once the horses have been ranked they are subscribed by the racing operators to the race which fit them most in terms of grade, age, gender and more. The Breeders’ Cup is ranked fifth among the most attended stakes races. It still trails events such as the Kentucky Derby and Kentucky Oaks but is still considered a high profile event among horse racing followers in North America and Europe.